This hydrating lotion lets your skin lock in moisture, improving both skin tone and elasticity. A combination of our Living Sea Complex® and a trio of Cornish seaweeds known to contain high concentrations of vitamins and minerals, are fused with frankincense and rose geranium pure essential oils. This creates soft skin and a light, fresh coastal fragrance, making each day feel like a holiday. Living Sea Therapy is a window on Cornwall’s unique geological past. It encapsulates Cornwall’s underwater voyage, involving ancient rock dramas and mysterious kelp forests, that yield our cobalt waters and unique sea minerals. 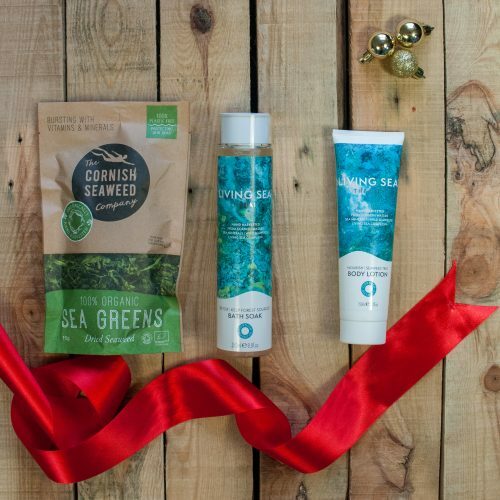 Working with our sister businesses, Cornish Sea Salt Co. and Cornish Seaweed Co. as well as a team of marine biologists, environmentalists and leading therapists, we have developed our Living Sea Therapy® range. Using sustainable hand harvesting and exclusive processes based on natural science we have created our wonder ingredient, Living Sea Complex® which combines three vital elements to harness the restorative powers of the sea especially for you and your skin.